I love it when a cat cafe either complements the owner's personality or the city where it is located. 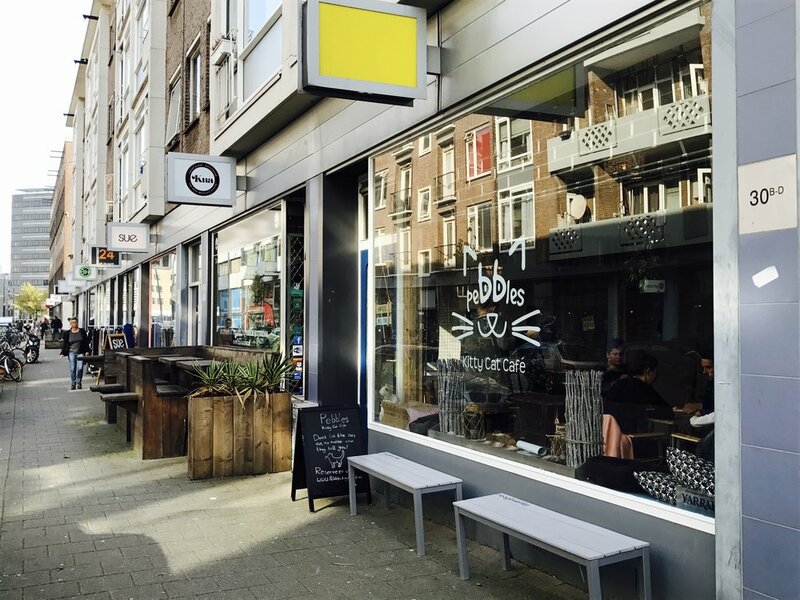 In the case of Pebbles Kitty Cat Cafe, it feels very Rotterdam. The space is bright and open with lots of clean lines and an architecturally pleasing vertical 'skyline', consisting of elevated wall platforms and, my favorite, a huge climbing tree that looks like it has actual bark. The wooden accents are carried throughout the cafe, which is the perfect warming touch. The cafe has a set up best suited for cat watching vs. cat interaction as seating rings the wall, leaving the interior for cat equipment. The atmosphere is very cafe-cool and encourages lounging with lots of cozy spots, board games and an eighties pop music soundtrack. Pebbles bucks the standard one-hour system and does not have a time restriction. I was greeted and seated by a friendly staff member who went above and beyond to accommodate me as the cafe was quite full (it was school break) and I didn't have a reservation. Luck was on my side and I got in, but shame on me because I know better! Pebbles has eight cats in permanent residence, all rescues. I didn't interact with them much except for one very curious black kitty with taste for coffee that, despite my attempts to rebuff him, ended up covering himself, my apple pie and the floor in latte. I apologized profusely and the staff were so nice about the whole thing, I felt even more guilty for not being more careful! Latte and apple pie replaced, I quickly consumed them before kitty returned. Both were extremely delicious and well-priced- including the entrance fee, my total bill was only €9.95. The menu consists of a variety of coffee, tea, cold drinks, desserts and light lunches such as sandwiches and quiches. With a lovely room, friendly staff, fantastic food, the environment at Pebbles Kitty Cafe makes it an ideal place to spend a relaxing afternoon with some furry felines.